Don’t take a chance if your Leicester home seems to be letting in water under the roof. We’ll pop round and take a look at your fascias, soffits and barge boards to make sure the roofline is watertight. Occasionally, they may have shifted, cracked or rotted – especially on older houses – so get us in to inspect the damage and we’ll get it sorted. Some firms out there will offer a cheap and shoddy service, but we won't. We're proud to be among the elite companies in Leicester. That's because we go out of our way to offer the highest levels of customer service to go with it. 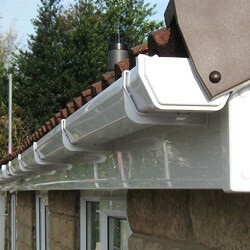 For a free estimate for uPVC fascias, soffits or roofline plastic call us on 0116 316 9544. We want you to be happy with your new fascias and soffits, so we'll take the time to find out what you want from us. There's no pushy sales pitch, and you won’t end up with things you didn't ask for. We'll always talk to you first before commencing any project. We'll take care of you and your roofline.